IJOY COMBO RDTA 2 is a new generation RDTA with interchangeable gold-plated building decks/coils up to 12. It is a 25mm diameter tank with a large 6.5ml e-liquid capacity that can be filled through the convenient side fill system. With ultem wider bore drip tip, the COMBO RDTA 2 offers a better vaping experience. 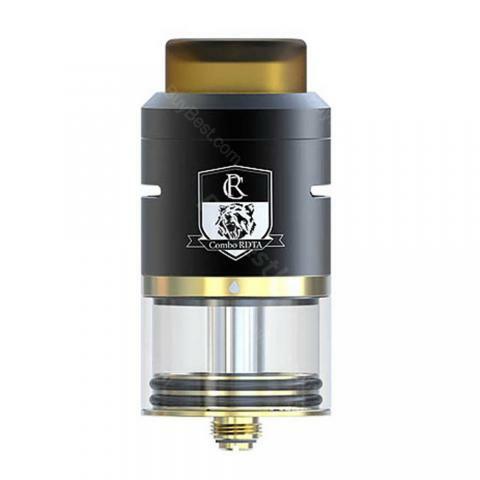 The IJOY COMBO RDTA 2 is a versatile rebuildable dripper atomizer after the famous COMBO. The COMBO RDTA II tank features unique interchangeable deck system with optional ten 24K gold plated build decks and two pre-made sub-ohm coils. It comes with an IMC-10 clamp snag system build deck and an extra 0.15ohm IMC-Coil 3 triple Coil atomizer heads. You can switch it from a RDTA to Sub-ohm tank freely according to your preference. The side refill system make the e-liquid filling never so easy. Grab the Combo RDTA 2, and enjoy clouds vaping without any hassles. • It's also compatible with IMC-1/IMC-3/IMC-4/IMC-5/IMC-6, IMC-2, IMC-7/IMC-8/IMC-9, IMC-Coil and IMC-Coil 3. It looks and works great. Genuine product, vapes awesome! Love the different build decks. Super easy to build on, the flavor of it is amazing , will buy again. It's the cloud monster, tank holds enough juice to last. All in all, five stars!